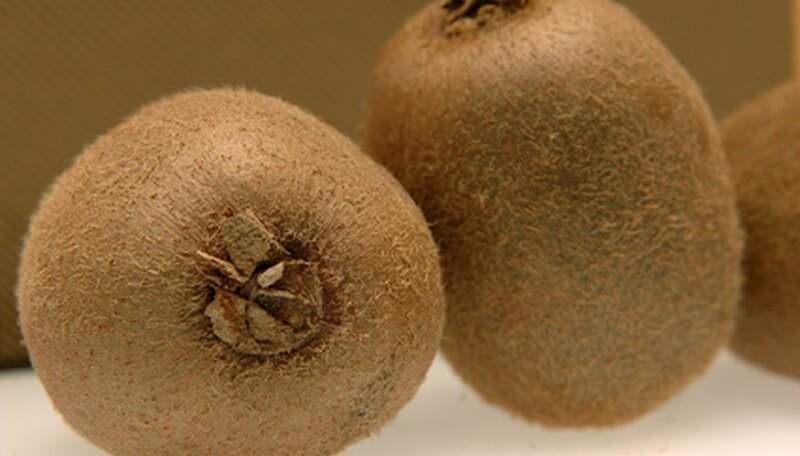 Kiwis are fast-growing vines with beautiful foliage and edible kiwi fruits. Most varieties of kiwi vines enjoy warmer climates, but can withstand winter temperatures down to about 10 degrees Fahrenheit. Some “hardy” kiwi varieties can endure even colder temperatures, down to -25 degrees or colder. Kiwi vines usually take two to five years to begin bearing fruit, and the vines can grow 30 feet long or more. A single kiwi vine can produce up to 25 pounds of kiwi fruits, making a sturdy support vital to growing the kiwi vines properly. Plant your kiwi vines in a location that receives full sunlight and has some protection from high winds. You can plant the kiwi vines in a wide range of soil types, but the soil must be well-draining. Water your kiwi vines deeply once or twice each week throughout the late spring and summer. Water the vines only when you don’t receive at least ¾ inch of rainfall during the week. Control weed growth and retain soil moisture by spreading a 2-inch layer of organic mulch in a 2- to 3-foot circle around the kiwi vines. Replace or add mulch each year as needed. Feed your kiwi vines once each year in the spring with a slow-release, balanced fertilizer. Follow the instructions on the fertilizer label for fruiting vines. Prune back your kiwi vines to just four or five buds, about 1 foot from the ground, immediately after planting them. Choose the healthiest, strongest stem as your main stem, and then train the main stem to grow to the top of the arbor, trellis or fence support. Prune away all lateral shoots except for the two top shoots that grow from either side of the main stem’s tip buds. In the second year in early spring, cut back the two main lateral shoots, or “cordons,” back to eight or 10 buds. Trim back all of the previous season’s growth to about 10 buds beyond the last fruit in early spring. Also remove all broken, crowded, tangled or twisted canes from the kiwi vine. You must provide a strong support for your kiwi vines to climb and grow on, such as an arbor, fence or trellis, that's at least 6 feet tall. To harden off your kiwi vines in the fall to prepare them for winter, stop watering the vines and don't fertilize them. Protect your kiwi vines from late spring or early fall freezes and frosts. In the fall, wrap the lower 4 feet of the trunk from the ground surface up with a foam pipe sleeve and remove it in the spring after all chance of frost has passed. Spread an additional 3 to 4 inches of bark mulch around the kiwi vine's roots.